SAMSUNG Galaxy Tab S2 SM-T713 8-Inch 32GB Wi-Fi Tablet - Gold. Condition is Used like brand New.comes with OEM magnetic Samsung case. Excellent condition no scratches has screen protector on it.Shipped with USPS Priority Mail. 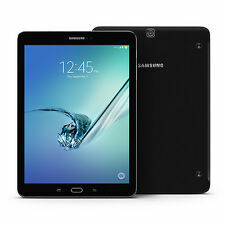 Black Samsung Galaxy Tab S2 8.0 32GB SM-T713 Tablet. Device is in 100% WORKING condition. It has been extensively tested and found to be fully functional. Certain phones will require a sim card or an existing smartphone data plan. Trending at $167.41eBay determines this price through a machine learned model of the product's sale prices within the last 90 days. Samsung Galaxy Tab S2 (SM-T710) 32GB, Wi-Fi, 8in - Black. It has been tested and cleared. The item that you receive may show different signs of wear, but will not exceed the conditions shown in the photos. Samsung Galaxy Tab S2 SM-T810 with screen issue. 32GB Storage. This tablet has burn-in image on the LCD - see pictures. Tablet only, does not include any accessories. 9.7" touch screen. In good working condition other than screen issue. Trending at $154.00eBay determines this price through a machine learned model of the product's sale prices within the last 90 days. Accessories and AC Adapter are NOT Included. Condition: No retail packaging. Case has light scratches, but is free from any deep scratches, cracks, or other large blemishes. Screen: LCD works perfectly. Screen glass has light scratches, but is free from any deep scratches, cracks, or other large blemishes. O/S: The device boots and operates without issue. Audio: Tested and working. Mic: Tested and working. Camera: Tested and working. Wifi: Tested and working. IMEI Status: N/A Android Lock: No. Carrier: N./A Accessories: No accessories or cables are included, sale is for the tablet only. Stock photos used, but they are an accurate representation of what you will receive. Bid with confidence, we offer a 30-day money back guarantee. Orders placed by 9PM CST will be taken to the post office before 8AM on the following business day. Thanks for looking. This unit indicates moderate signs of use, including scratches, scuffs, dents and stains throughout the exterior casing. AC Adapter and USB Cable are not included. (1) USB Cable. This item has been fully tested and found to be functional as described. ITEM FUNCTIONALITY: Device is fully tested and in 100% working order. Reset to factory original settings. The device is locked to Verizon and WiFi COSMETIC CONDITION: ---Almost new cosmetic condition. No scratches, no scuffs, no dents, no blemishes. ITEMS INCLUDED: It will not have a sim card, headphones or the original box It will not have a generic charger NETWORK Technology GSM / HSPA / LTE LAUNCH Announced 2015, July Status Available. Released 2015, September BODY Dimensions 237.3 x 169 x 5.6 mm (9.34 x 6.65 x 0.22 in) Weight 389g (Wi-Fi) / 392g (LTE) (10.51 oz) SIM Nano-SIM DISPLAY Type Super AMOLED capacitive touchscreen, 16M colors Size 9.7 inches, 291.4 cm2 (~72.7% screen-to-body ratio) Resolution 1536 x 2048 pixels, 4:3 ratio (~264 ppi density) PLATFORM OS Android 5.0.2 (Lollipop), upgradable to 6.0. Make: Samsung. Check with the manufacturer for more warranty information. Model: SM-T710NZKEXAR. USED Samsung Galaxy Tab S2 SM-T713 32GB, Wi-Fi, 8in - Black - Bundle. - 8" screen with 2048 x 1536 resolution, high-resolution screen is ideal for gaming and streaming HD content. - There are No Scratches or wear on any surfaces, great condition. Samsung Galaxy Tab S2 SM-T813 32GB, Wi-Fi, 9.7in - Black. Condition is Used. Shipped with USPS Priority Mail. Excellent condition Galaxy Tab S2. Everything works perfect; we are just upgrading. The tablet has ALWAYS had a screen protector and folio case. No smoking. It has just been factory reset and will be functioning as new when you receive it. Form Factor: Slate. Galaxy Tab S2 SM-T813 Tablet. Optical Drive Type: No. Battery Capacity: 5870 mAh. Color: Gold. Quick Start Guide. MicroUSB Cable. Travel Adapter. Samsung Galaxy Tab S2 9.7" 64GB Wi-Fi SM-T813 (Black). Since this is a pre owned item expect minor scratches and scuffs. All photos are of the item being sold. We are here for you! NEED IT FASTER?. (1) Book Cover (EF-BT810PBEGUJ). Battery Capacity5870 milliampere hours. Battery TypeLithium-ion. Color CategoryBlack. Weight13.8 ounces. Number Of USB Port(s)1. Processor Number Of Cores8. Wireless DisplayNo. Samsung Galaxy Tab S2, 9.7-Inch, Black Built for ultra-fast performance, the sleek Samsung Galaxy Tab S2 lets you take your digital content with you wherever you go. Photos and movies come to life on a crisp, clear Super AMOLED display, while expandable memory lets you enjoy more of your favorite content without running out of storage space. Not only is the Galaxy Tab S2 powered by Android Marshmallow OS, but it also makes connecting and sharing between all your Samsung devices easier than ever for a seamless user experience. View Images and Videos in Vivid, Lifelike Quality Thanks to its Super AMOLED display screen, the Samsung Galaxy Tab S2 brings your movies, pictures, and video games to life with deep contrast, rich colors, and crisp detail. Make: Samsung. Check with the manufacturer for more warranty information. Model: SM-T817TZKATMB. Trending at $172.97eBay determines this price through a machine learned model of the product's sale prices within the last 90 days. Samsung Galaxy Tab S2 SM-T813 32GB, Wi-Fi, 9.7in - Black. Condition is Used. The tablet works fine. Its in good cosmetic condition with some marks from normal use. Included is the micro usb charging cable and adapter. Shipped with USPS Priority Mail Medium Flat Rate Box. There is a very slight scratch 1/4" long on the screen near the bottom right of the screen, you can not feel the scratch by touch nor does it affect the picture quality. Very slight distortion if you look really hard on a bright white otherwise screen and tablet itself is in perfect condition, you wont be disappointed with it, well taken care of! Android 6.0, Marshmallow OS, 8.0" 2048x1536 (QXGA) Super AMOLED. WORKING CONDITION. Item ID: S3556. 1.8GHz Quad 1.4GHz Quad Octa-core processor. EXCELLENT CONDITION. Samsung Galaxy Tab S2 SM-T817A 32GB, Wi-Fi 4G Cellular (AT&T), 9.7in - Black. Condition is Used. Shipped with USPS Priority Mail. Two cases come with it including a keyboard case. Keyboard and tablet are in used condition but both work fine. Make: Samsung. Check with the manufacturer for more warranty information. Model: SM-T817AZKAATT. Samsung Galaxy Tab S2 SM-T813 32GB, Wi-Fi, 9.7in - Gold, Excellent Condition. No physical flaws. Excellent working condition. Samsung Case & Charger included. Condition is Used. Shipped with USPS Priority Mail. NOTE: Uneditable product description states 8 in. screen. This is incorrect and the screen size for the device that I'm selling is 9.7 in. Samsung Galaxy Tab S2 SM-T817T 32GB, Wi-Fi 4G (T-Mobile) - Black. Condition is Seller refurbished. UNLOCKED I've had this tablet for about 2 years, and it is still in pristine condition. I have already unlocked the device. I am also offering an M Edge wireless keyboard case included with the tablet. If you have any questions shoot me a message and i will get back to you as soon as possible. 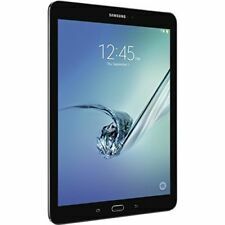 Item Title: Fair - Samsung Galaxy Tab S2 SM-T710 32GB - Black (Wi-Fi ONLY) 8in - SEE NOTES. A Fair designation is for a device that has a heavy amount of scratches, marks, nicks and/or cracks on the housing and/or display screen as a result of previous usage. Combine powerful performance and wireless connectivity with the black 32GB Galaxy Tab S2 9.7" Wi-Fi Tablet from Samsung. For high-speed Internet connectivity, dual-band 802.11a/b/g/n/ac Wi-Fi with MIMO technology is built-in. Samsung Galaxy Tab S2 SM-T813 32GB, Wi-Fi, 9.7in - Black. Condition is Used. Shipped with USPS Priority Mail. Great condition. Was kept in a cover. No scratches or cracks. Works great. Will be shipped in original box with usb data cable, charger and sim card key. Samsung Galaxy Tab S2 SM-T713 32GB, Wi-Fi, 8in - Black. This item is the Samsung Galaxy Tab S2 Model: SM-T713 32GB. This item is USED, but it has been tested and found to be in good working condition. This is a perfect working Galaxy Tab S2. Always been in the keyboard book cover and always had a tempered glass screen protector on it. It comes with the keyboard book cover, a 32 gig sd card and the original charger. No scratched or flaws on it. I was using Google Fi on it so it is unlocked. Tablet is no longer needed, and was never used in the first place. The Samsung Galaxy Tab S2 SM-T817V is a useful device driven by a robust Octa-core processor and running on Android 5.1 Lollipop platform. In addition, it runs on a 5870 mAh Lithium-ion battery for uninterrupted usage. Case included! Samsung Galaxy Tab S2 SM-T813NZKEXAR 9.7" 32GB Wi-Fi Black. Shipped with USPS Priority Mail. Device will come charged but no charger will be included. Samsung Galaxy Tab S2 32GB, Wi-Fi, 8in - Black, Excellent Condition With Cases!! Samsung Galaxy Tab S2 32GB, Wi-Fi, 8in - Black, Excellent Condition With Cases!! Only 1 1/2 years old and gently used. Has a tempered glass screen saver for protection, no scratches, or any screen damage, in perfect condition. Comes with 5 different cases that are like new. Also comes with the cord and charger. Lost box in move. Comes from a smoke free home. Serious buyers only!! Tired of the time wasters, don’t bid if you can’t pay. You will be blocked. Please don’t hesitate to ask questions, thanks. 5 out of 5 stars - Samsung Galaxy Tab S2 32GB, Wi-Fi, 8in - Black, Excellent Condition With Cases!! 75 product ratings75 product ratings - Samsung Galaxy Tab S2 32GB, Wi-Fi, 8in - Black, Excellent Condition With Cases!! 9.7" Tablet 64GB Android - Black. 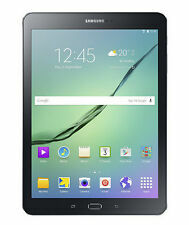 Samsung Galaxy Tab S2 SM-T810. Securely cleared of any data. Securely cleared of any data. Tested, In Good working conditions. 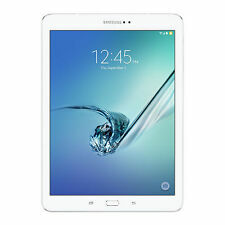 Samsung Galaxy Tab S2 32GB, 9.7in, White (SM-T813NZWEXAR) Brand New & FS! With Quick Connect, send videos and photos from your Galaxy Tab S2 screen to your Samsung Smart TV3 to share with everyone in the room. Or start a show on your TV and, with the touch of a button, take it with you by moving it to your tablet. This tablet is USED and has been FULLY TESTED. All buttons press properly and function as intended. THE LCD IS IMAGE BURNED. Condition is Used. Built for ultra-fast performance, the thin and lightweight Samsung Galaxy Tab S2 goes anywhere you go. And connecting and sharing between all your Samsung devices is easier than ever. Built for ultra-fast performance, the sleek Samsung Galaxy Tab S2 goes anywhere you go. And connecting and sharing between all your Samsung devices is easier than ever. With Quick Connect, send videos and photos from your Galaxy Tab S2 screen to your Samsung Smart TV to share with everyone in the room. Samsung Galaxy Tab S2 SM-T710N 32GB, Wi-Fi, 8in*Gold *READ* SAME DAY SHIP!